By using dynamic optimization and optimal control, the optimal operating conditions can be derived for different objectives. Evaluation of the control profiles allows for the derivation of reactor-separator-networks and integrated reactor-separator-systems which can be used for the development of integrated processes together with subproject D1. In B1 the approach is exemplified using the reductive amination of 1-undecanal and the hydroaminomethylation of 1-decene. on the stability and robustness of the reactor. Special attention is also given to the mixing properties in the case of different phase combinations. 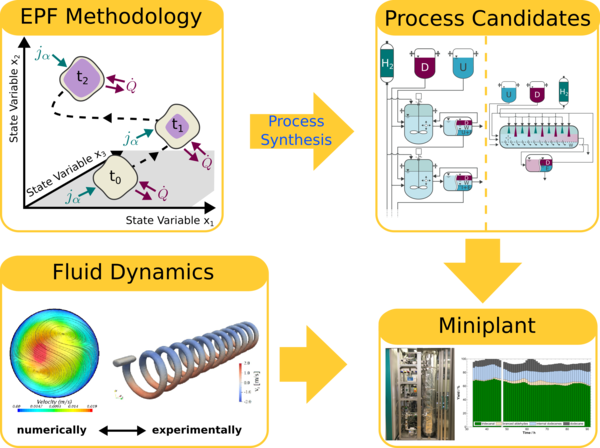 These investigations are performed using stand-alone models and under mini-plant conditions together with the subprojects D2 and D3 to validate the methodological approach and to further improve the reactor design. McBride, K.; Kaiser, N. M.; Sundmacher, K. Integrated reaction-extraction process for the hydroformylation of long-chain alkenes with a homogeneuous catalyst. Comput. Chem. Eng., 2016. Peschel, A. Model-based design of optimal chemical reactors. Otto-von-Guericke-Universität Magdeburg, 2012.